You’ll pardon me for being the last to talk about it, talk about it, talk about it, talk about it — but the reincarnation of the old Sitka & Spruce as Nettletown is now complete, and the ever-talented Christina Choi — with help from her friend Matt Dillon — has opened her new Eastlake cafe. Taking the sting out of spring, at Nettletown . If you’re a regular at the Saturday University District Farmers Market or the Ballard Sunday Farmers Market, you may recognize Christina as the friendly face behind Foraged & Found Edibles — a business she co-founded with an even more recognizable face, Jeremy Faber. 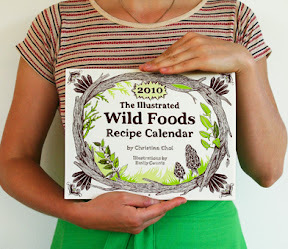 Maybe you even keep track of your life with her Illustrated Wild Foods Recipe Calendar. 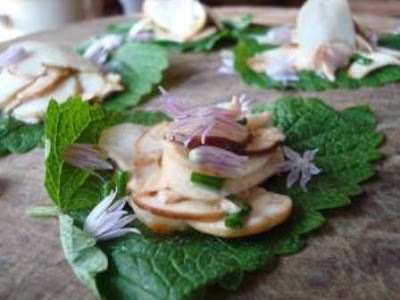 Christina Choi, whose seasonal recipes for wild and foraged foods are a timely reminder that we live in a food-lover’s paradise [photos courtesy Christina Choi]. If you know anything about eating well in this town, you should be thrilled to learn that Christina has put down roots under Sitka & Spruce’s old tree, which underwent a physical transformation. At Nettletown, she’s devoted to serving “yummy food” (her restaurant’s tagline) with a menu that makes the most of the Pacific Northwest’s wild and wonderful ingredients. For now, Nettletown is open with truncated hours (lunch Tuesdays through Fridays 11 a.m. to 3 p.m. and brunch Saturdays and Sundays from 10 a.m. till 3 p.m.), but stay tuned to the Web site and blog for extended hours. They’ll soon be open for dinner, Sunday Suppers and special events, including the upcoming March 29 Spring Foraging Dinner — a feast to celebrate the season, with Matt Dillon and friends lending a hand in the kitchen ($50, call 206-588-3607 for reservations). In search of edible nettles? Nettletown is an obvious place to look, but it’s not the only one. Seattle restaurants, fancy and not-so, glory in their ability to tame the stinging nettle, and if you’re adept at foraging your own, or able to score some at the farmers market, here’s a link to a Seattle Times recipe for nettle soup, which would go really well with a nice loaf of homemade brown bread.